Many thanks for your friendship and custom during 2016. 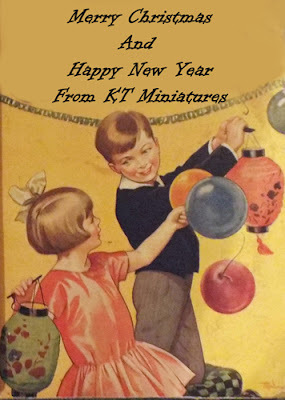 KT Miniatures is now closed for the festive season and will be open again on Tuesday 3rd January 2017. 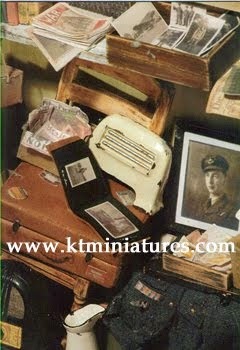 A Few Miniature Curios....Some Quite Rare! 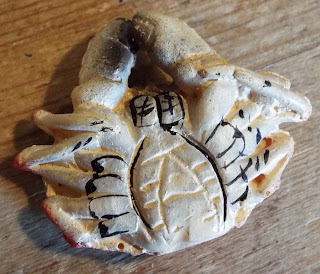 If you have been following KT Miniatures' website this week you will have noticed that in the past few days quite a few items have been put up for sale. Some flew off the shelf almost immediately but there is still plenty on offer. 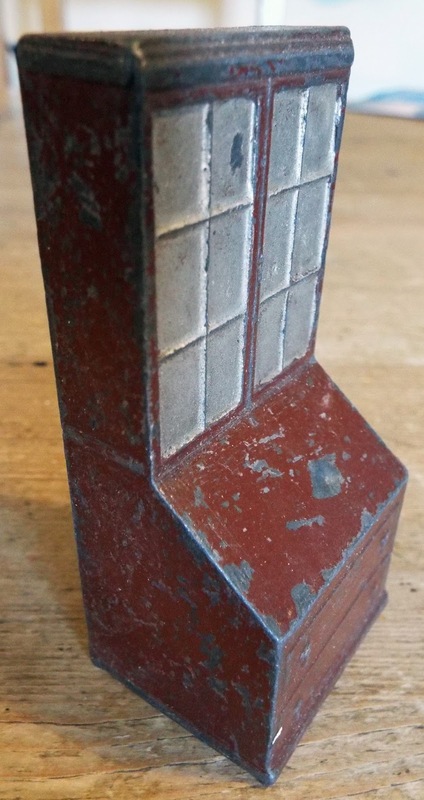 I have handled a fair few c1930s Charbens metal furniture pieces over the years but this is the first time I have had this particular model, so I would say that this is one of the more rare Charbens items. This antique plaster crab is such a curious thing - I have never seen anything quite like this before. 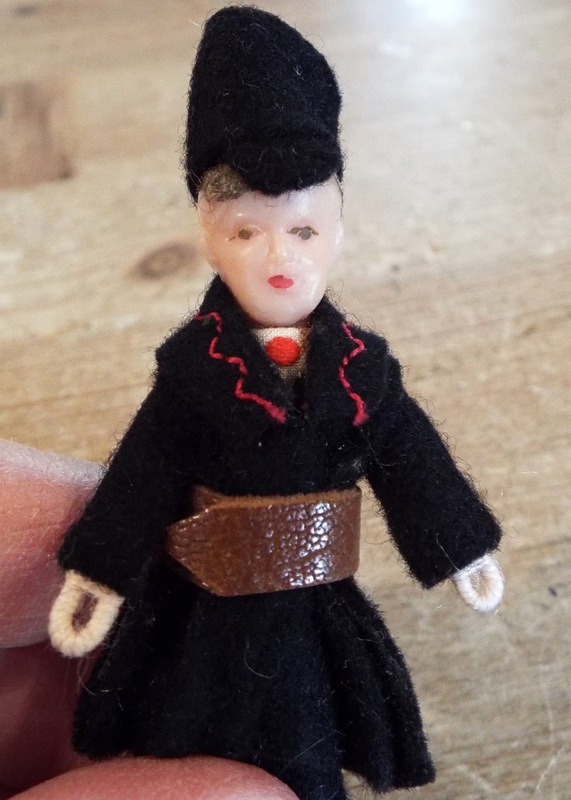 Its exact age or origin is unknown but I suspect it is probably of German make and as it came with a group of early 1900s dolls house items, I am assuming it is from that era. He just makes me smile! Then there is this cast iron Victorian bucket, it is so heavy. One can just imagine how much enjoyment this has given many little people over the decades, as it is a tad on the rusty side inside and has probably been filled with water many times. This miniature wood and black bristle brush is exquisite, measuring 1 1/2" long. 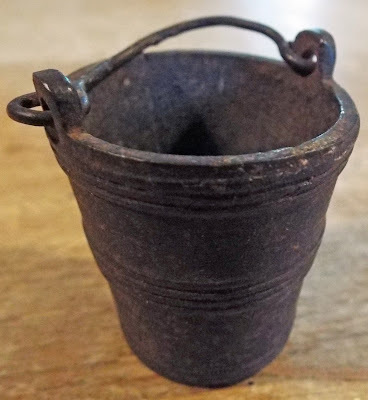 Again, exact age or origin is unknown so I would describe this as vintage. If you have an old dustpan that is in need of a brush then this could be for you. 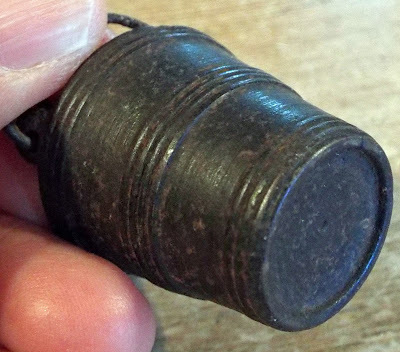 This is another curious item! 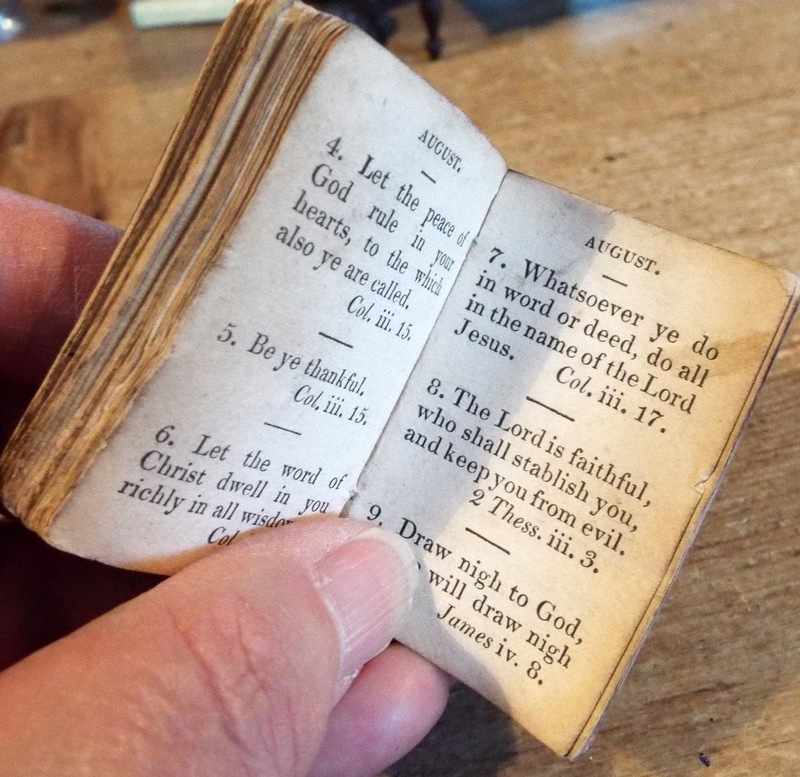 It is a KIDDICRAFT MINIATURE CHEQUE BOOK. I understand that this was produced in conjunction with Martins Bank Ltd during the 1950s-1960s and is literally an exact miniature version of a Martins cheque book. All cheques are still present and unused, and even though the first cheque has been removed it is still present. I have placed a 20p piece in one of the photos above so that you can instantly get a feel for the size of this item. 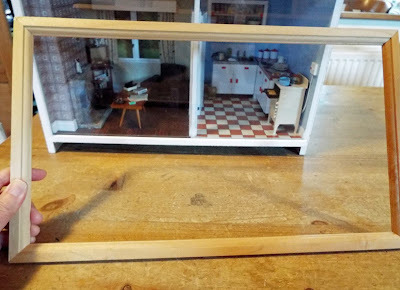 As you can see it is quite large in scale but if you have an old dolls house or miniature shop where scale does not matter, this could be a fantastic addition to your collection. 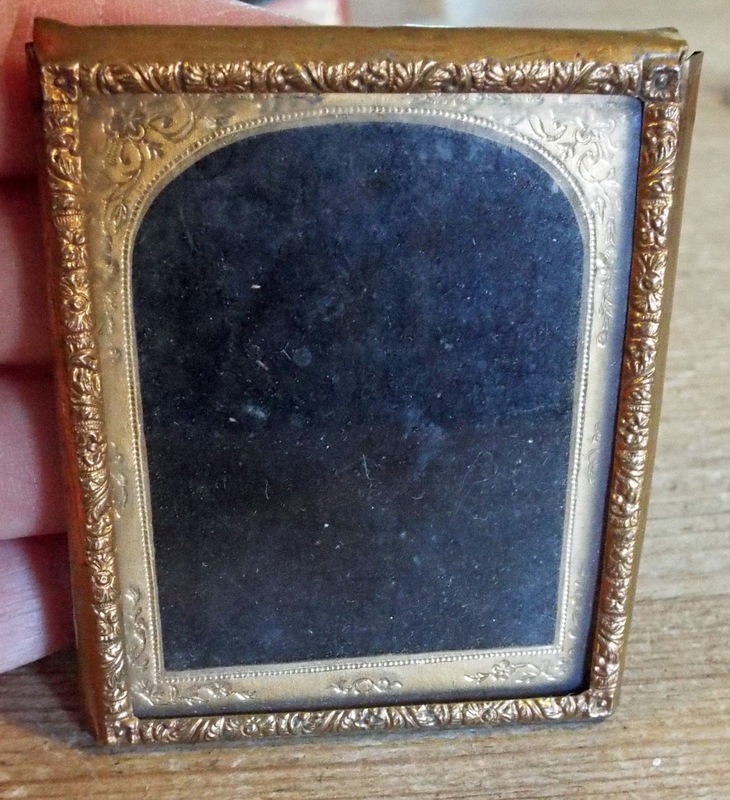 This is a lovely Victorian metal and glass picture/photo frame. Actually we know that it used to house a photo, simply because on the backing paper is the wording: G. HERBERT - PHOTOGRAPHER and there is a Banbury address. But the photo is long gone. However, it is in super condition and perfect for someone to put their own photo or old picture inside and hang on an old dolls house wall. 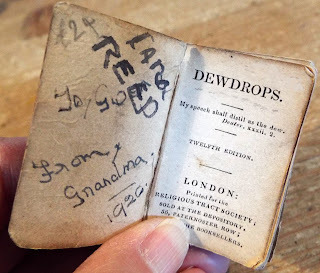 Now a real antique gem...when I first obtained this DEWROPS miniature book, I assumed that it dated from c1920s because inside there is an inscription in ink saying FROM GRANDMA 1920. 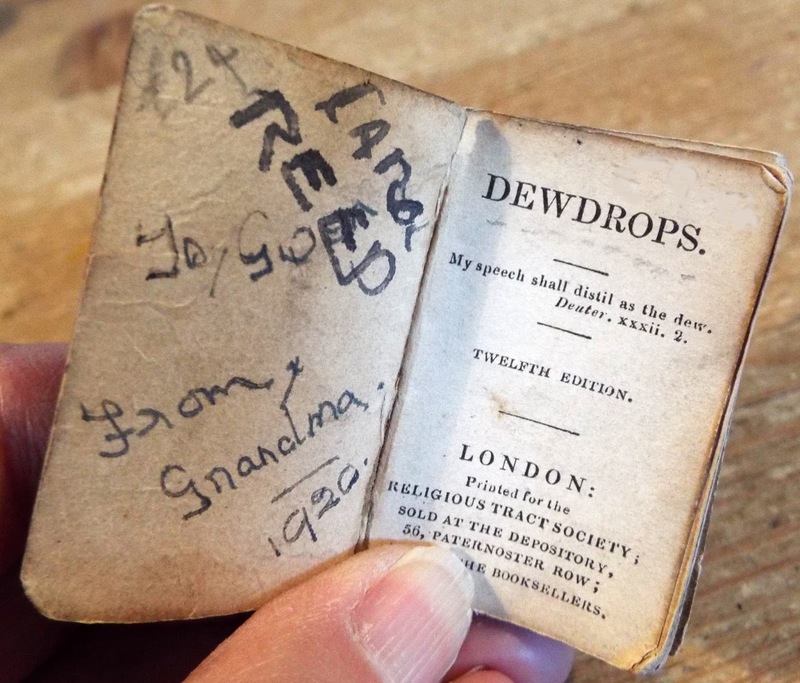 I cannot make out who the recipient Grandma intended it for as it is faded plus a later owner has written in big ink letters her name too. However, on researching CHISWICK PRESS: CHARLES WHITTINGHAM, the named printer, I realised that in fact this is probably a lot older than first thought. Apparently Charles Whittingham died in 1876 and someone else took over his company, so this has to be pre 1876! 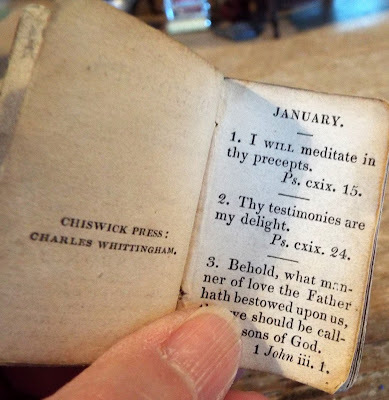 I am now of the opinion that as this is a book of biblical verse for each month of the year, that "Grandma" was passing on a family item to their grandchild. 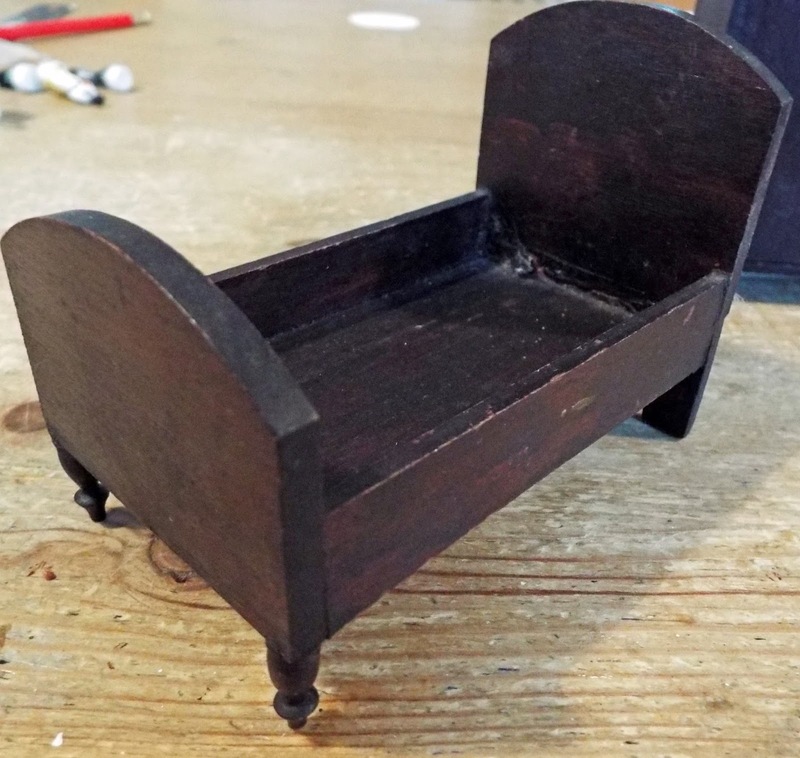 There are lots more old miniature treasures to be listed to KT Miniatures this coming week..so do keep checking the website and feel free to get in touch if anything takes your fancy! 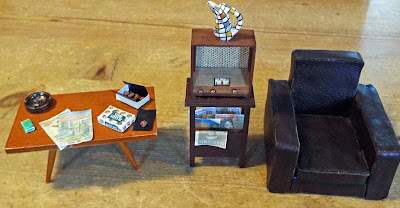 Now up for sale are two handmade scenes, both prototypes made for "how to make" features for past issues of the Dolls House & Miniatures Scene Magazine. I am in the process of undertaking a massive clearout of my workroom, and have decided to be ruthless in what goes and what stays. This has been one of my favourites but it is time to let it go, and I would very much like it to go to a good home. 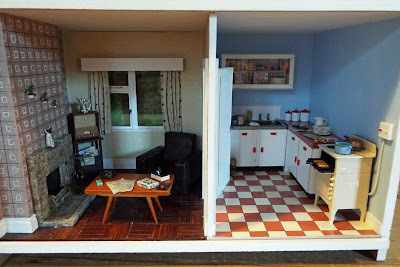 It is a 1950s duel room scene of a living room and kitchen which was created for a “how to make” article featured in the August & September Issues 2006 of the Dolls House & Miniature Scene magazine. Over the years this has been displayed at various venues and events so has been well travelled. If you are a fan of the 1950s then this may interest you, particularly if you do not have room for a dolls house. 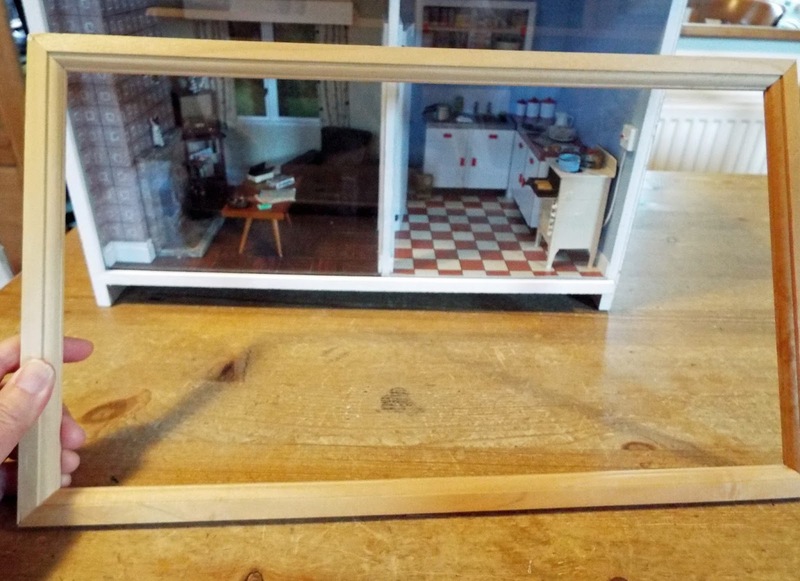 Vintage dolls house collectors may have noticed that the coffee table is a vintage Barton 1/16th scale dining table! 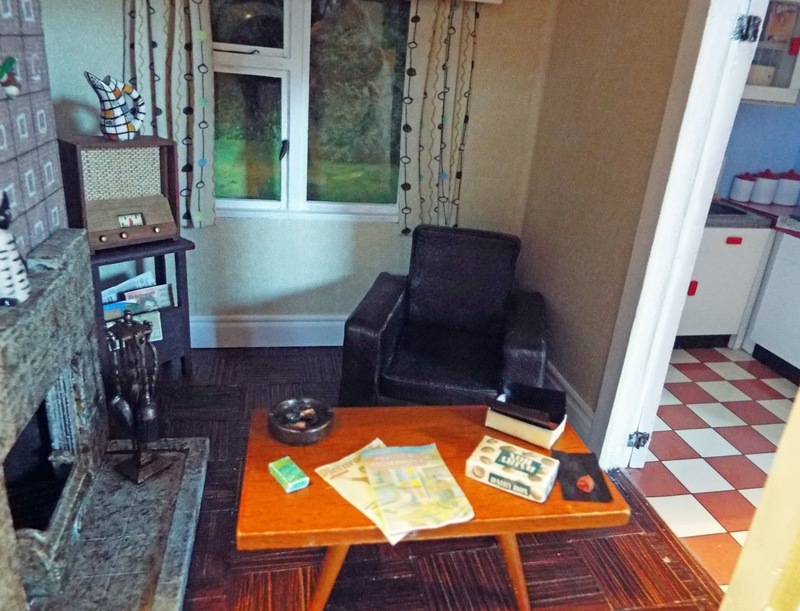 The living room furniture is removable so you can change the room around and adapt to suit your own needs, although everything else is fixed down. The 1950s cat ornament (which can be seen on the mantlepiece of a painted 1930s-1950s tiled fireplace) and jug on top of the wireless were made by Sally Meekin and available back in 2006. 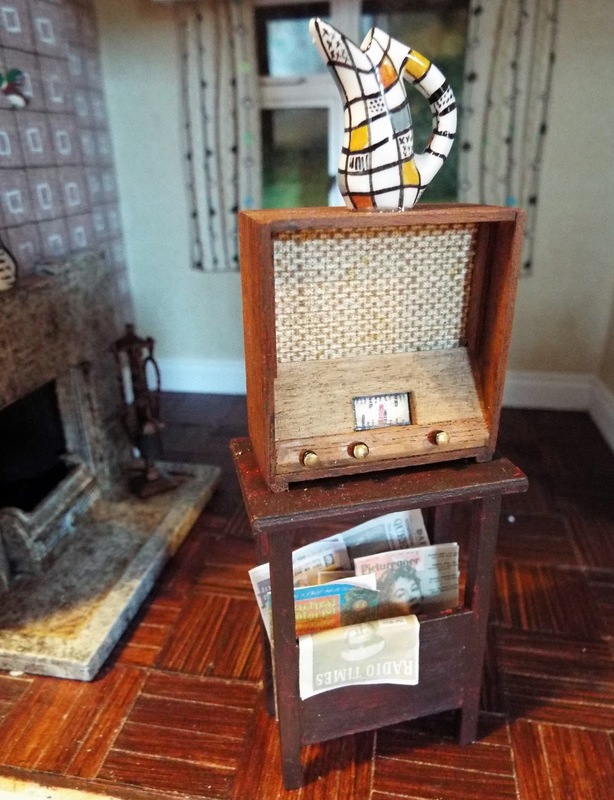 Amongst items included in the "how to make" instructions, was this wireless table. 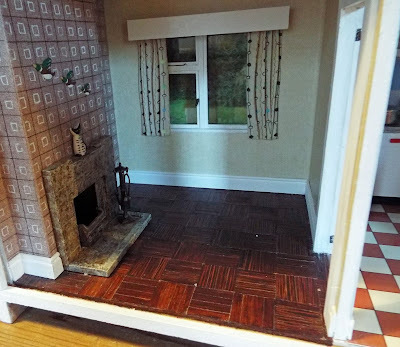 Part of the feature was showing people how to design one's own 1950s style wallpaper and curtain material, plus block "wooden" flooring out of cardboard! The architecture was meant to be that of a 1930s house that had been updated by the elderly resident of the abode who was keen on DIY. So the door which is fixed into an open position, is a prime example of how in the 1950s, hardboard was fixed over each side of a 1930s panelled door to make it stylish for that time. The kitchen cabinets have been made from a variety of materials including foamboard, cardboard, card, etc.and are all fixed into place. The cooker is an old Phoenix electric cooker that was given the KT Miniatures painted treatment. Much of the food was contributed for the article by the now retired artisan Mags Cassidy. 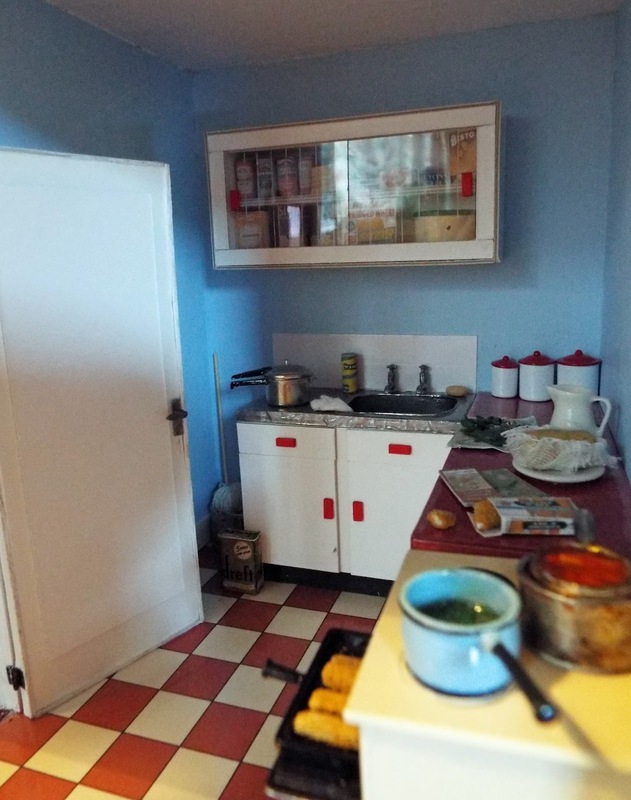 All the packaging that you can see, particularly in the wall cupboard, was created with the use of the computer after undertaking much research at that time I seem to remember. It was challenging but fascinating. 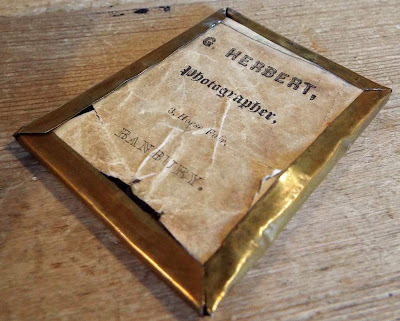 This room box is heavy and fragile, so it is advisable for any prospective purchaser to collect in person from me here in Thame. However, it would be possible to post, although due to the weight and fragility, it would be both expensive and there will be a risk of damage in transit. The room box itself is made from MDF and was supplied by Sid Cooke (sadly no longer trading) and it came with a wooden frame which I still have but never used, and will include with the sale. 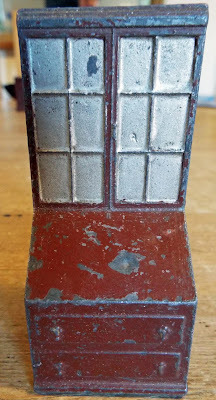 It can be painted or varnshed and fixed to the front of the room box. 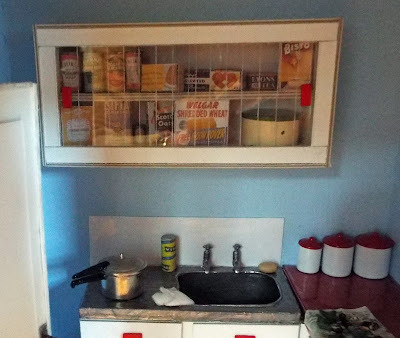 There is a sliding perspex front. 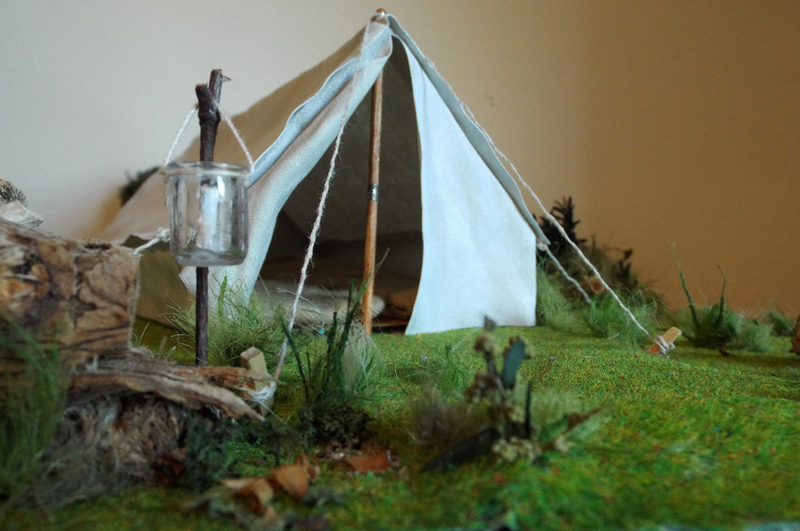 This is the 1/12th scale prototype of a camping scene that my workshop colleague and great friend Robin Britton created with me for a "how to make project" for Dolls House & Miniatures Scene Magaze starting in the May 2015 issue (No. 252) and then several consecutive issues after. This is also surplus to requirements, and both Robin and I would very much like this to go to a good home too. 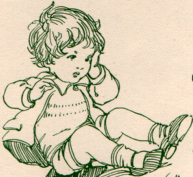 This versatile scene had been inspired by books from our childhood such as ‘Swallows & Amazons’ and ‘The Famous Five’ but could be used in a variety of ways. 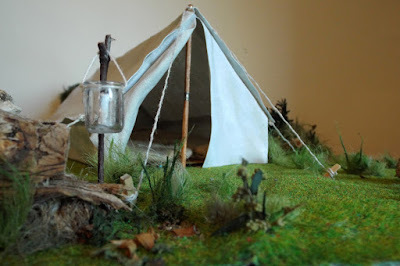 We used all kinds of natural and manmade materials to not only landscape the MDF base but also to make the tent and accessories. In fact the tent was made from the leg of a pair of M&S trousers! 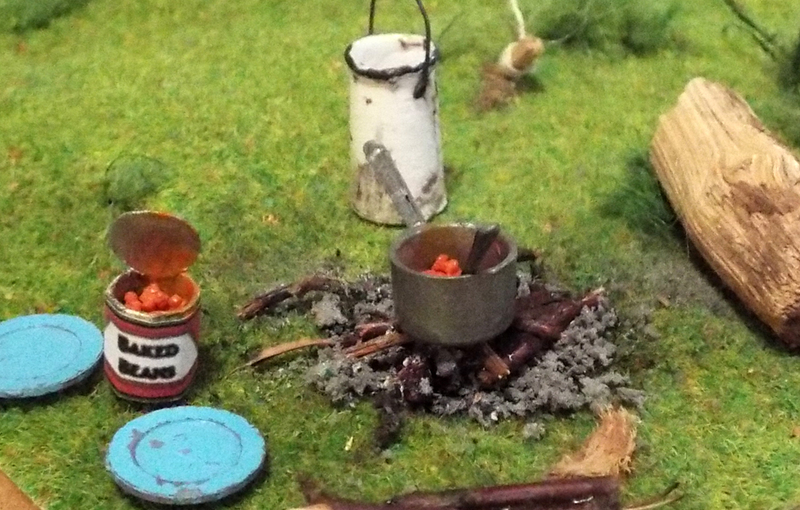 Instsructions in the feature showed how to make this billycan and tin of baked beans. Included in this sale is the vintage Dol-Toi saucepan of baked beens and two tiny blue vintage Dol-Toi plates. 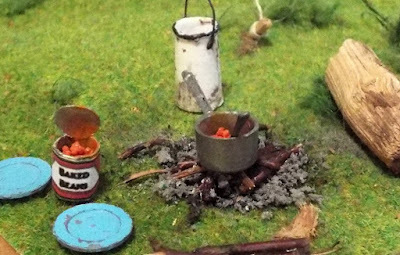 These campfire accessories are loose but everything else in this scene is fixed. Along the back of the scene is a uniquely made hedge plus there is an impromptu washing line with a pair of tiny socks hanging up to dry. 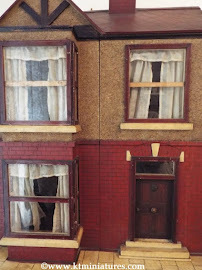 This could be butted up against an old dolls house for an imaginative garden scene, but it would equally made a fantastic backdrop for a scouting or guiding scene, or perhaps a vintage childhood scene to stage some old dolls, or how about a miniature teddy bears picnic? There is plenty of scope to adapt this scene to suit your own needs and let your imagination go wild! 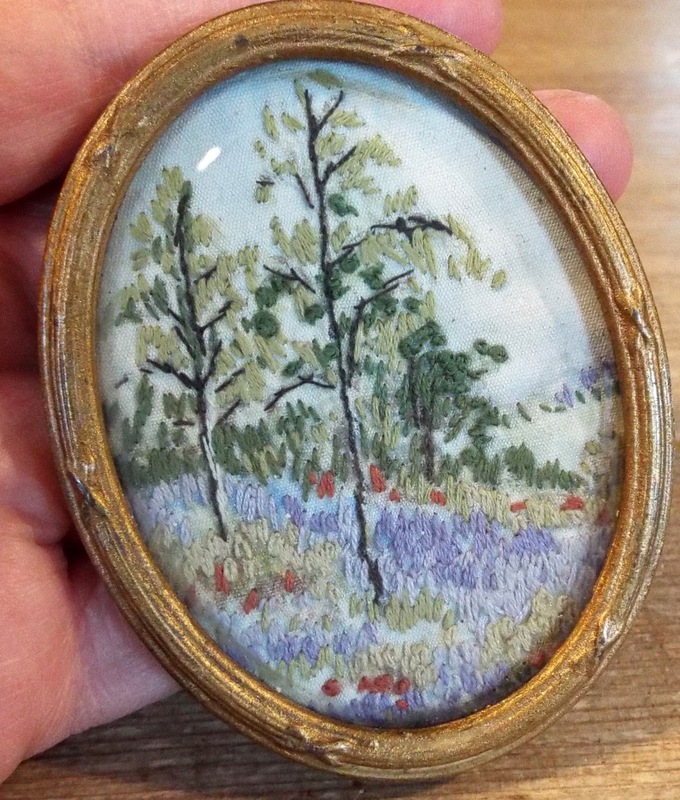 As mentioned above, these miniature scenes are not only heavy but rather fragile so it is strongly advisable to collect from me here in Thame, Oxfordshire. However, it would be possible to post but there is always that risk of damage in transit. If you are interested and would like to discuss further, please do not hesitate to get in touch. 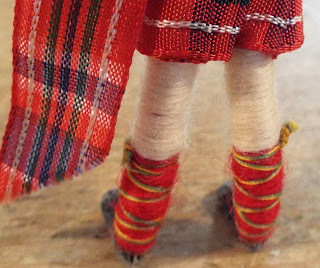 They would make wonderful and unusual Christmas presents for someone....or why not treat yourself? Ok, so I have had a niggle in my right knee for months. It started off very minor to begin with...then it progressed to a wince each time I went up and down stairs. Just lately at the end of the day, it was becoming a little more painful and my children were nagging me to go and see the doctor to get it sorted. However, somehow I just never got around to making that appointment, life kept getting in the way...you know how it is. But then there was an "oops moment"! 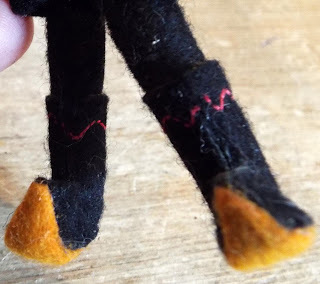 I was climbing out of my attic workroom with a box in my hand early one morning last week, and simply due to lack of concentration I landed awkwardly and heavily, completely miscalculating the large step down. I've been climbing in and out of my workroom almost daily for nearly 20 years without a single mishap, so only have myself to blame. 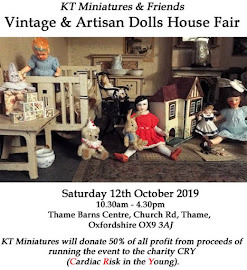 So I'm afraid that the planned listing of further vintage items to KT Miniatures has been put on hold for this week...sorry. Am currently sitting here with a packet of frozen peas on my knee! This Gnome Now Has A New Home To Go To! 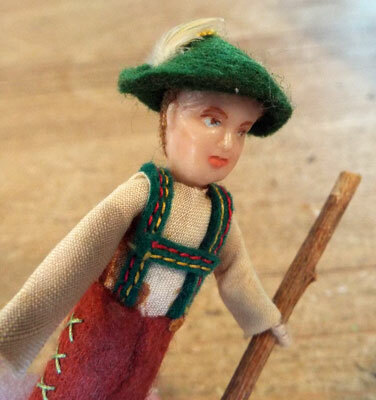 Almost as soon as this rare Britains lead gnome went up for sale, he was snapped up. Mind you, its not surprising really as examples like him just do not come along very often. What a handsome chap he is! At just 2" sitting height, he is rather big as gnomes go in 1/12th scale terms...but hey ho. 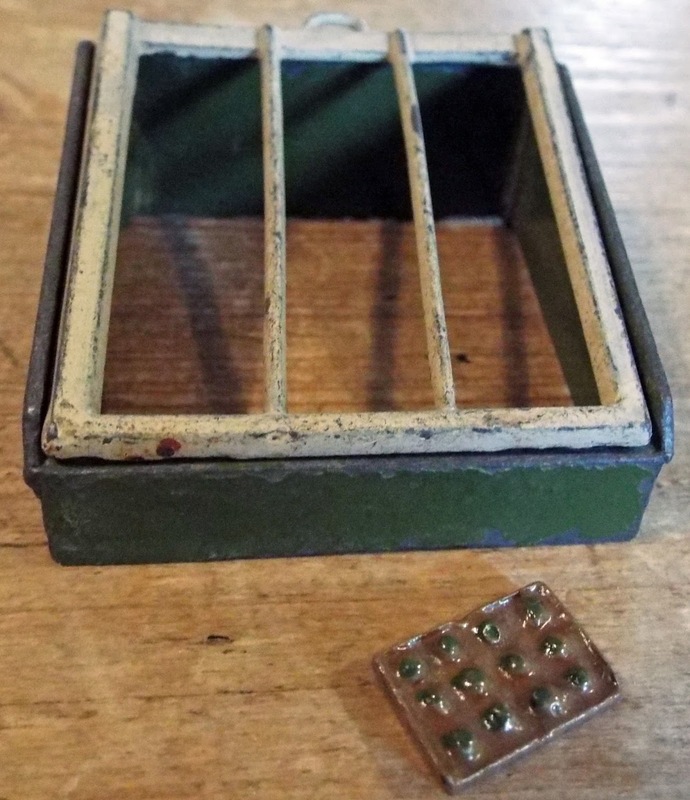 He was put up for sale with this old Britains lead cold frame, complete with a rare weeny Britains lead seed tray! 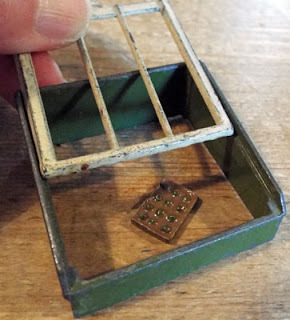 The seed tray measures just a tad more than 1/2" x 3/8" wide...now that really is small! The white lid is able to slide in and out of the cold frame base. 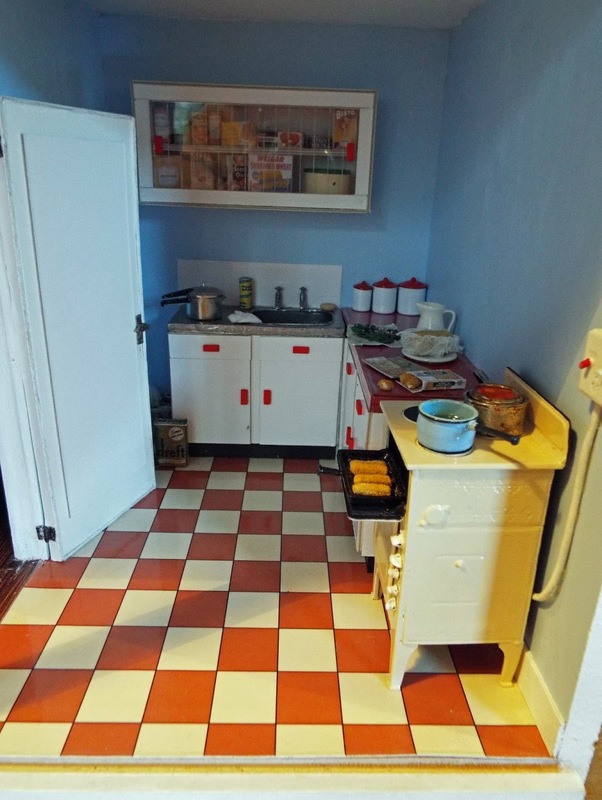 Unsurprisingly this was snapped up almost as soon as it went up for sale too. 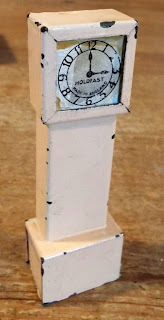 For further photos of these items plus more Britains Lead Garden pieces to purchase, PLEASE CLICK HERE. A variety of vintage miniature items have now been added to KT Miniatures website and are available to purchase, including some highly sought after c1920s Lines Bros/Tri-ang furniture. But more about those another day. To be honest, an awful lot has been happening here behind the scenes and although I had every intention to get stuck right back into KT Miniatures in October, real life determined otherwise and distractions have been preventing me from working at full capacity. However, at long last this week I have been able to undertake some vintage listing to the website and there are some curious items now available to purchase for your old dolls houses. 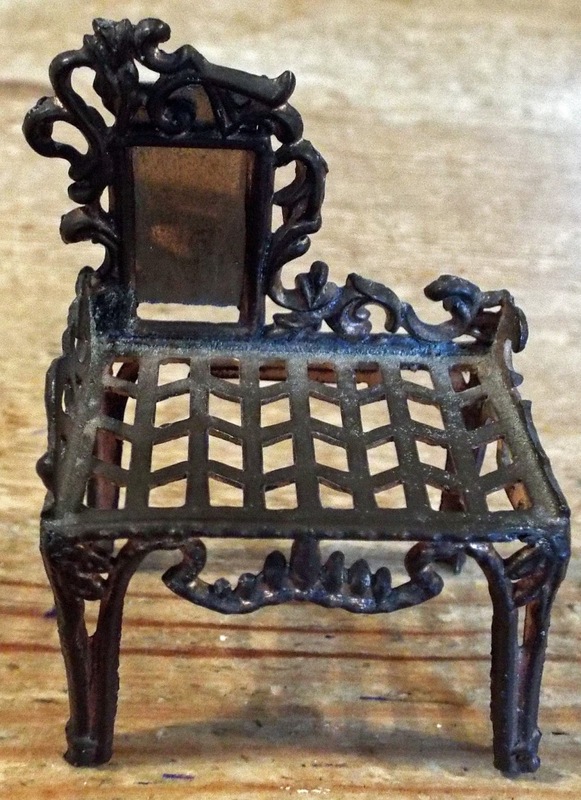 Such as this early 1900s French Simone Et Rivollet metal dressing table. 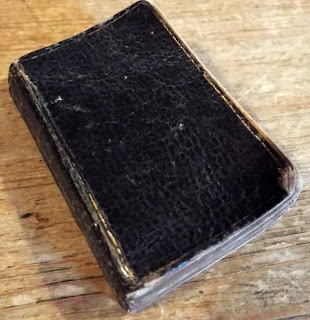 And yes ok, it may have a tiny portion of scrolling missing on the right hand edge but as it is probably more than 100 years old I think it can be forgiven. Unusually it still does have the original mirror fully intact, which is nice. 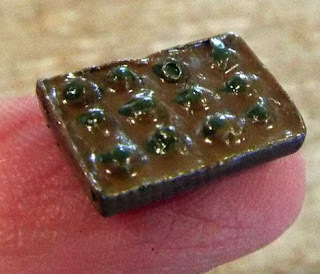 It is quite tiny, so probably most suitable for 1/24th scale. Then there is this rather lovely c1920s/30s German bed and wardrobe set. 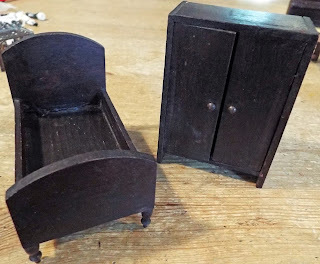 The bed has two attractive turned legs at the footboard end. 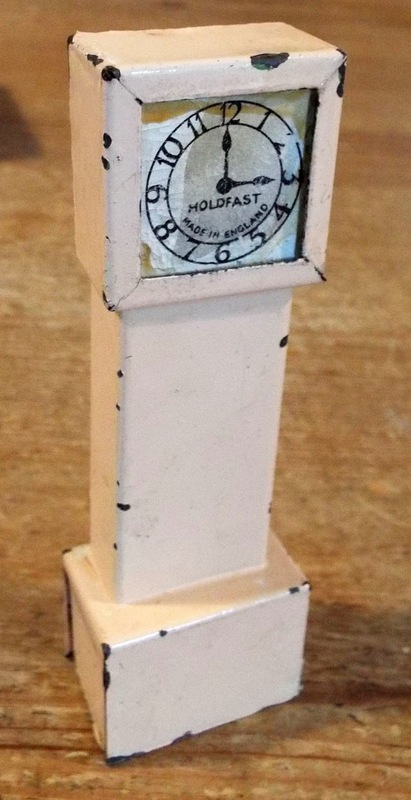 Then there is this pink c1930s "Holdfast" tin grandfather clock. Ok, it may have a few bumps and scrapes but there is something quite nice about it. This old embroidered framed picture of trees and flowers is quite exquisite and the photo just doesn't do it justice. 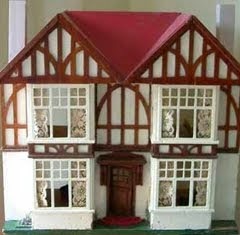 Am sure it would look fabulous hanging on the wall of an old dolls house where scale does not matter. It is a little bit big measuring just over 3" high but am sure it would be useful to someone! 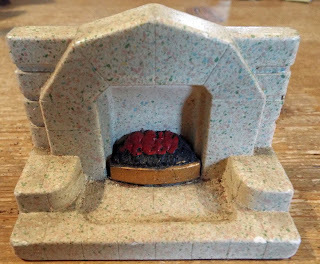 I am a great fan of vintage plaster fireplaces and this one was sold by Barton in the 1960s. 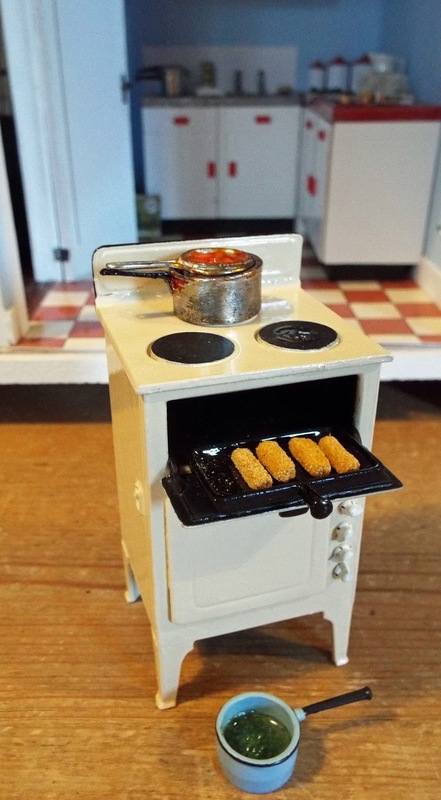 As a child I had a pink one of these - long gone now though! This version is light in colour and speckled, as you can see from the photo. It is in great condition with only a couple of nibbles on the front hearth edge. 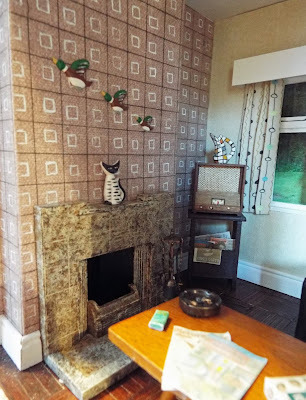 As these plaster fireplaces were quite fragile in young hands (including my own) they were prone to damage, but this one is in good condition. I love it! The style of this is such that it could look just as much at home in a 1930s house, as well as a 1940s/50s dolls house...and not just the 1960s when it was actually made. The design did not change that much during those eras. What a handsome young chap this Scottish Dol-Toi doll is in his traditional Scottish outfit. 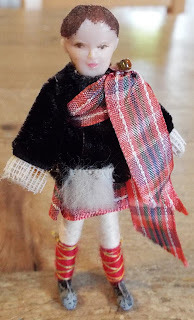 He is part of the old Children Of All Nations Dol-Toi doll range. 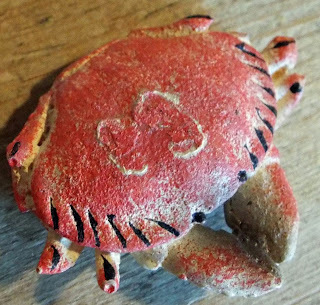 I undersand he has lost his hat. 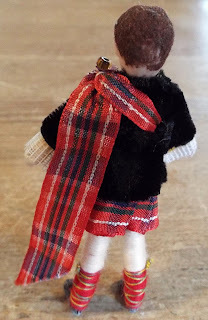 He does still have his sporron though along with his kilt, and his socks are just exquisite! 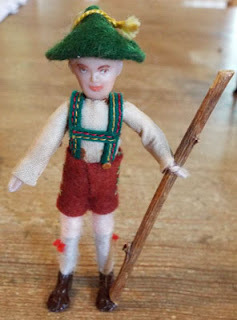 Then there is this young Tyrolean lad from the same Children Of All Nations Dol-Toi doll range. I love the tiny red decorative garter detail at the top of his socks! 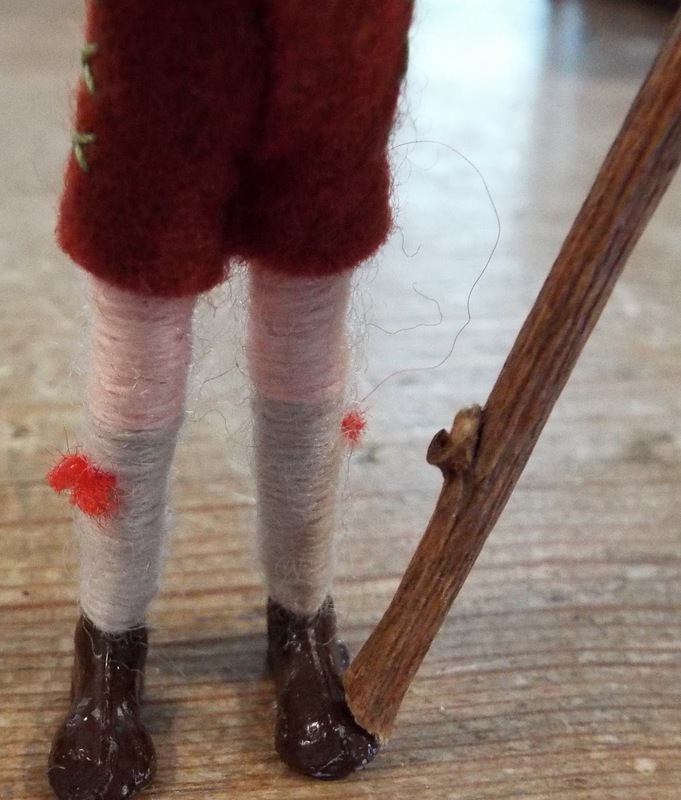 The brightly coloured simple stitching on his lederhosen is rather attractive, don't you think. And can you see the tiny feather in his hat? Am not 100% sure which country this young lad is supposed to represent from the Children Of All Nations Dol-Toi doll range, but he does look rather splendid and is very well made. To the top of his helmet he measures 3 3/4" high. His belt is made of leather. I love his curly shoes!